Video has always been created in a horizontal format. Enter Snapchat, where vertical videos have a completion rate 9X higher than horizontal video. So is horizontally formatted video still a smart idea? The reason for horizontal, or landscape, format video was simple. If you are a human being, which I’m assuming you are, your eyes are on a horizontal plain. Side by side. Our field of vision is wide and not tall because of evolution. The problem is, how we hold a smartphone is also encoded in our DNA. The user experience of a smartphone is to hold the phone vertically. You wouldn’t expect a user to flip their laptop into portrait mode to watch a movie they are streaming. Nor would you expect people to flip their flatscreens by 90 degrees to watch a vertical video in the comfort of their living room. 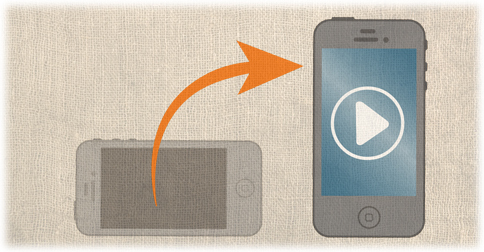 So why are mobile users expected to flip their screens to watch video, then flip it back to interact? We live in the age of selfie marketing. Creating a video or story, is within arm’s reach. When you shoot video on a smartphone, you hold the phone in a portrait orientation. It’s how your hand, and the phone, most comfortably create video. Why wouldn’t it be the most natural user experience to consume it that way too? Being forced to turn your smartphone on its side to watch a video is unnecessary. That said, I’m still not a fan of vertical video. It works great on mobile and on mobile alone. It’s also only great for short snackable content, not long form video. If I’m streaming a movie from Netflix, I want the whole experience not a tiny vertical sliver of how the video was originally intended to be viewed. Even the vast majority short form content on YouTube was created and designed to play videos horizontally. So where does vertical video fit in? Snapchat’s high completion rates for vertical video is because it is a mobile first platform. Everything about the user experience is designed for mobile first. Vertical video was not meant for television. Vertical video was not meant for desktop computers. Vertical video thrives only on mobile. Periscope, Twitter’s live video streaming app also defaults to vertical format. Interestingly 90% of video views on Twitter occur on a mobile device, but the vast majority of videos are horizontal. If you are creating content specifically for Snapchat, going vertical makes total sense. Periscope as well functions better vertically. You could even experiment with going vertical on Twitter and on Instagram now that they’ve moved outside the square. Test how vertical video performs for you. After all, Instagram is a mobile first platform. For video content anywhere else, I’d stick with the traditional horizontal format. It fits the user interface for your website, YouTube and Facebook. Honestly landscape style video just looks better on those platforms too. However, if your target market is on Snapchat, you’re using Periscope or you’re running video ads on mobile games or apps, then vertical video is the way to go. Will vertical video become the default format for mobile? Time will tell. Ultimately you need to create video content so your viewers will consume and engage with it on whatever platform they are watching it on. What about you? Are you or your video marketing efforts going vertical?